Secure storage 24 hours a day, 7 days a week. Our containers are suitable for long term or short term storage. We understand that there are a number of reasons why you may need furniture self storage. It could be because you are moving house and there is a delay between the completion of your old and new house, perhaps you have inherited some family furniture, or maybe downsizing and the need to keep some furniture for the children. Whatever the reason, our storage facilities are an ideal solution for all types of furniture storage and are here to help you. 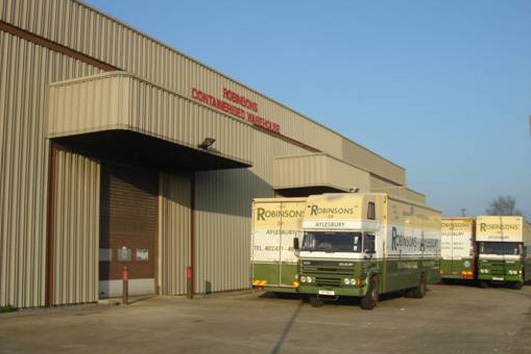 It was in 1984 that Robinsons of Aylesbury decided to build a storage warehouse in the Buckinghamshire area using a modern "container" system. For many years removers used conventional storage facilities, adding time and cost to each move. Containerised storage offers an Easier, Quicker and Practical method as well as a Safer environment. 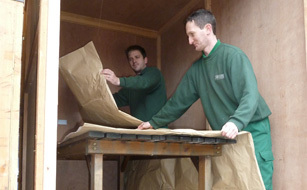 Our storage containers are suitable for long term or short term storage. Easier because it takes less time to load and unload your goods at our warehouse. Quicker as our fork-lift makes light work of loading into and out of store. Practical as it helps to lower handling problems and removal costs. Safer as all your goods are sealed into their own units within a dry and secure environment. The storage containers are designed to fit inside our vehicles, which then allows our staff to load your goods directly from your home into our storage containers. The crew will prepare an inventory of all the goods that are loaded into each container and a copy is sent to you. All furniture and other similar items are carefully wrapped in 4-ply paper blankets to provide complete protection. On arrival at our warehouse the storage containers are off-loaded by fork-lift and carefully placed into a set position within the warehouse. Each one is numbered and named and is entered into our record system. Large or odd shaped items such as settees, carpets, ladders or even sheds, can be stored in separate areas of the warehouse, either because of their size or to avoid pressure marks occurring. For delivery at your new home, the storage containers are then reloaded into our vehicle and your furniture is unloaded straight from the container. Security in our store is a major consideration and our warehouse is comprehensively equipped for intruder or fire alerts. The system is N.A.C.O.S. approved and is monitored 24 hours a day. We are proud of our warehouse and the facilities that we can offer you, and as such we always welcome personal inspection, with no obligation, prior to any anticipated storage period. 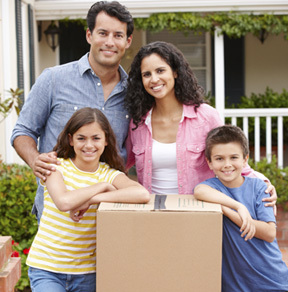 We are also pleased to offer self storage solutions (D.I.Y.) for clients who are possibly looking to save on the costs of removals by bringing their goods to our warehouse in their own van or car. Either way our large parking area provides plenty of room for a large or small vehicle and the containers can be placed either outside or inside our warehouse immediately adjacent to your vehicle for loading, making it quick and easy. The same 4-ply blankets that our staff would use would also be available in order to protect your furniture. Our storage containers are 250 cu ft/ 35 sq ft. Approximately for a 3 bedroom house content storage you will need 3/4 containers and for a 2 bedroom house you will need 2/3 containers. Please telephone our office for further information about our self storage service. As well as Aylesbury we operate throughout Buckinghamshire, High Wycombe and the surrounding areas.